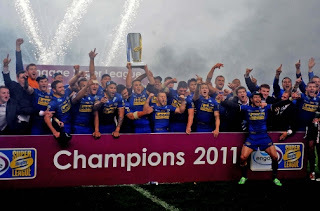 Last week Leeds Rhinos cemented their place in history, not only as the first team to win the Grand Final from outside of the top two, but they also recorded their fifth title in only eight years. Let's look at the win on Saturday, a win that seemed impossible at the mid-point of the season when Leeds were struggling to keep a place in the top eight. At that point in the season - exemplified by the ignominious 38-18 loss to Catalan Dragons - Leeds looked like a team without direction. They were making silly mistakes,and some of the team selections were confusing. They somehow managed to drag themselves to the Challenge Cup Final, after a favourable draw and a shade of luck against Castleford in the semi-final - Chase will be thinking about that drop goal attempt for years to come. But it was at Wembley where the belief started to come back - well after the first 20 minutes at least. Although they lost, something had changed. They would go on to win all their remaining games. Us fans saw a glimmer of hope, although nobody would have dared dream that it would end up with a championship. When the playoffs rolled around, the Rhinos were written off. While they were always expected to make it past Hull, and maybe get a result against an off-form Huddersfield team, they would surely come unstuck against Warrington - the winners of the League Leaders Shield. However, the Leeds players had a renewed self-belief, fuelled by their performance - and perhaps the injustice - in the cup final, as well as with the words of the experts who had written them off. Warrington were undone, beaten in the last minute by a Kevin Sinfield penalty. In a game where most of the 50/50 calls went against Leeds, they battled through, defended brilliantly and attacked with a purpose, basically doing everything they had not done in the first half of the season. The following Saturday they headed to Old Trafford to face St Helens in the Grand Final, for the fourth time in five years. Nobody had expected this, everyone had eexpected Wigan against Warrington. For the first time in Super League history two teams from outside of the top two had made Super League's biggest match. In what has to be one of the best goalline stands in rugby history, Leeds held off the Saints for 4 straight drop-outs at the start of the second half. They also showed incredible spirit to come back from 16-8 down to win the game 32-16. Sometimes a little self-belief goes along way; here was a team that was down and out, written off by the press, not to mention their own fans (coach Brian McDermott was booed by a section of the Leeds support in their last home game of the regular season). Yet they had always had the ability - you do not win 5 Championships in 8 years without talent - and clearly wanted to win for their coach, and each other. In doing so they proved everybody wrong and carved their names into history. I tip my hat to these guys for not giving up, for giving us another championship and for proving the cliché that form is temporary, while class is permanent.